S4BB Limited just released the final version of FlipSilent for BlackBerry® Storm™ and Storm2™. 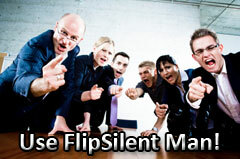 FlipSilent provides the coolest way to mute your phone by just flipping it when a call is incoming. Flip the phone to silent. More incoming calls will be silent too. Flip the phone back and the normal profile reactivated. Activate or deactivate FlipSilent whenever you want. Works flawlessly after device reboot/reset. Silence the phone with elegance (i.e. in a meeting). Exclusively for BlackBerry® Storm™ and Storm2™.